Who would of thought reading could be so much fun! Some of LC3 read a book about 'The Impossible Bridge' and they then created their own. The test was to see whether a car could cross it. 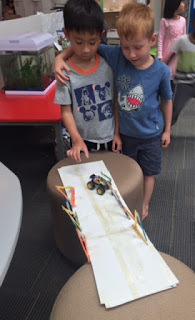 Aiden and Cheston loved sharing their design and success! Our students are still loving their PINS Workshops and at the moment we are making the most of our Japanese Students and the skills they bring. Here are a few shots!